Henize 2-10 is a small irregular galaxy that is not too far away in astronomical terms — 30 million light-years. 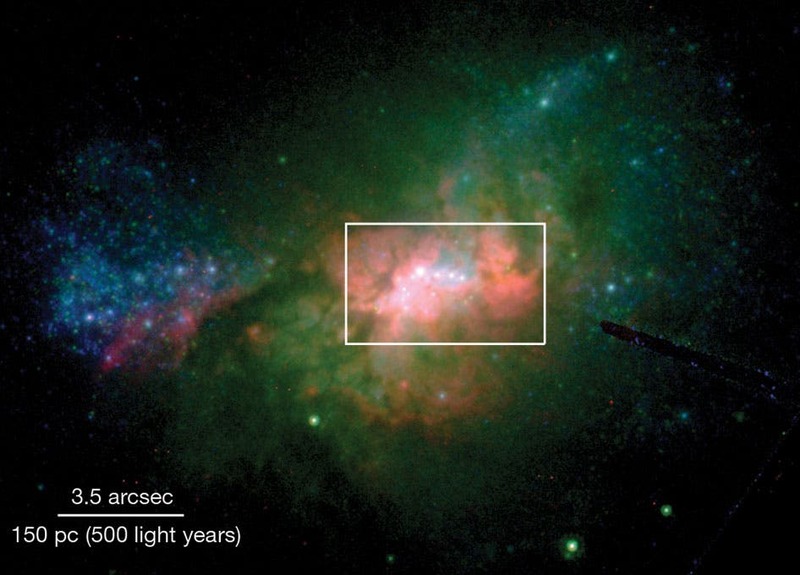 "This is a dwarf starburst galaxy — a small galaxy with regions of very rapid star formation — about 10 percent of the size of our own Milky Way," says co-author Ryan Hickox, an assistant professor in Dartmouth's Department of Physics and Astronomy. "If you look at it, it's a blob, but it surprisingly harbors a central black hole." Their findings appear as an online preprint to be published in The Astrophysical Journal Letters. A PDF also is available on request. Suspicions about Henize 2-10 first arose in 2011 when another team, that included some of the co-authors, first looked at galaxy Henize 2-10 and tried to explain its behavior. The observed dual emissions of X-ray and radio waves, often associated with a black hole, gave credence to the presence of one. The instruments utilized were Japan's Advanced Satellite for Cosmology and Astrophysics (1997), the European Space Agency's XMM-Newton (2004, 2011) and NASA's Chandra X-ray Observatory (2001). "The galaxy was bright in 2001, but it has gotten less bright over time," says Hickox. 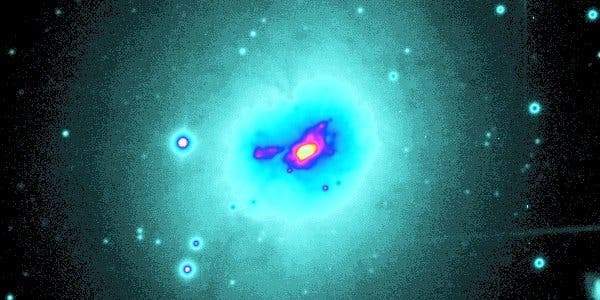 "This is not consistent with being powered only by star formation processes, so it almost certainly had to have a small supermassive black hole — small compared to the largest supermassive black holes in massive elliptical galaxies, but is still a million times the mass of the sun." A characteristic of supermassive black holes is that they do change with time — not a huge amount, explains Hickox, "and that is exactly what Tom Whalen found," he says. "This variability definitely tells us that the emission is coming from a compact source at the center of this system, consistent with it being a supermassive black hole." While supermassive black holes are typically found in the central bulges of galaxies, Henize 2-10 has no bulge. "All the associations that people have made between galaxies and black holes tell us there ought to be no black hole in this system," says Whalen, but the team has proven otherwise. Whalen, a recent Dartmouth graduate, is now a member of the Chandra X-ray Center team at the Harvard-Smithsonian Center for Astrophysics. A big question is where black holes come from. "When people try to simulate where the galaxies come from, you have to put in these black holes at the beginning, but we don't really know what the conditions were. These dwarf starburst galaxies are the closest analogs we have in the universe around us now, to the first galaxies early in the universe," says Whalen. The authors conclude: "Our results confirm that nearby star-forming galaxies can indeed form massive black holes and that by implication so can their primordial counterparts." "Studying those to get some sense of what might have happened very early in the universe is very powerful," says Hickox. Rogue Supernova in Deep Space –Are They Hypervelocity Stars that Escape Their Host Galaxy?